Roses are red. Violets are blue. But they’re deeply unoriginal, and costly, too. 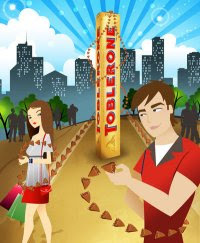 So instead, why not spread the sweetness of the season by indulging in a love triangle—all you have to do is log on to www.toblerone.com.ph for great ideas on how to celebrate Valentines Day in sweeter and more original ways. Log on to www.toblerone.com.ph and check out the Toblerone Fanpage where a community of like-minded, chocolate lovers await. This interactive site invites users to share their thoughts on different V-day traditions and gift ideas making it easier for singles and couples to share the sweetness of February. Nix the roses and go for the tried and tested: chocolates. Online, you can check out Toblerone’s gift giving application, which allows you to send virtual sweet treats to friends and loved ones this Valentine’s Day. Play a little game of Cupid this season by trying out Toblerone’s matchmaking application. This fun, online application lets you mix and match buddies online to check their compatibility and romantic potential. There’s no denying that love is in the air—and clearly it’s on store shelves too. Spread the sweetness literally and figuratively and grab a limited edition Valentine’s Day Toblerone. For the single and ready to mingle, be sure to head on to UNO Pizzeria Restaurant and Bar at San Miguel By the Bay on February 11, 2010 at 7pm as Toblerone, in partnership with Thinkpadd and UNO Pizzeria, hosts a Valentine’s Day speed dating exclusive. Whether you’re basking in unbridled romance or unbridled panic—Toblerone has got you covered. Be sure to log on to www.toblerone.com.ph and discover new ways to spread the sweetness on Valentine’s Day.